You have to hand it to the Democratic Party. When it comes to blatant hypocrisy, not only are they incredibly consistent, they have an uncanny ability to lie to you with a straight face. Nevertheless, Democrats have demanded everyone suspend their disbelief and heartily support Ford and the other women not because they are right or that proof is needed, but simply because they are women and thus, in the #MeToo era, should be believed outright just for making the allegation. Sen. Mazie Hirono, D-Hawaii, said something similar. “The credibility is there for her. So, I believe her,” she told The New York Times (and she’s a member of the Judiciary Committee – so constitutional ‘advice and consent’ for judicial nominees is now arbitrary and not subject to factual evidence or provable information). “This whole idea that the Republicans have, that women just sit around making these things up, that is not borne out by the reality,” she added. Do you get that? A woman makes an allegation and so it must be believed, period – sans evidence, sans corroboration, sans an investigation. But isn’t that a standard Democrats have imposed just on Republicans and conservatives? Absolutely it is, and Rep. Keith Ellison, D-Minn., is proof of it. An ex-girlfriend of Ellis’, Karen Monahan, a Left-wing activist, has accused him of physically and emotionally abusing her during the years they were together. The decision by the state party “to conclude that the allegation is unsubstantiated,” according to a version of lawyer Susan Ellingstad’s report obtained by The Associated Press, stems from Monahan’s refusal to turn over a video she says would prove her allegations. So, which is it – women should be believed just because they accuse, or they shouldn’t sans evidence? It obviously depends on which side of the political aisle the accused stands on. If he’s a conservative constitutionalist judge, he’s guilty (sans evidence), but if he’s a Democrat, then we not only have to have hard evidence but there has to be corroboration of same as well. 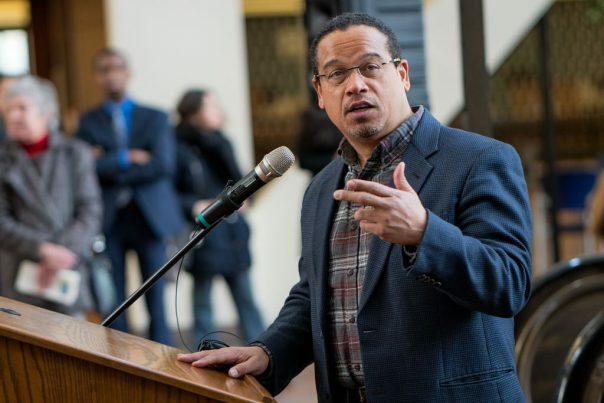 “Keith Ellison is being investigated by the party that endorsed his candidacy after multiple allegations of domestic violence. Any claim that this is an independent investigation is laughable,” said Ellison’s GOP opponent, Doug Wardlow. You know what else is laughable? The assumption that Democrats have any interest in something other than the raw pursuit of power. Read more about how Democrats have smeared Judge Kavanaugh at Smeared.news.